As the night unfolds, it reveals a cluster of heavenly bodies. The velvet pirouette of moths fluttering around glowing lanterns. Creatures of darkness, crickets and other dwellers of the shadows lying undercover, transmit their requests. -Excuse me, miss? Could you wrap that please? -Is it a gift, sir? The fragrance notes include osmanthus and jasmine. Update: see a review of Nuit de Cellophane. Hmm. Interesting. Tempting (though not due to the silly press release language, nor the name). Read elsewhere that additional notes include mandarin, myrrh, sandalwood, and civet. Yes, I've seen different lists of notes here & there too. All of those sound good! I have read that multiple times and I do not get it. Maybe it was originally in French and made a little more sense? The only Serge Lutens I have tried is A La Nuit, and because of that perfume, any mention of jasmine sends a shiver down my spine… so don't think I'll be trying this. the notes do sound good! But I do love osmanthus! Despite the name and the weird ad copy, can't wait to try it. The notes sound lovely and you know I'm a serge lover. Very strange name, but will probably try it and most probably love it, even if not necessarily on myself. Many Lutens do that for me – I wouldn't wear them, but I can't deny they're genius. And hugs to you, R.
I'm sorry, as soon as I saw that name the song “Mister Cellophane” from Chicago popped into my head… I wonder if the fragrance is as per the song lyrics “you can look right through me, walk right by me, and never know I'm there”!!! Perhaps this is some Dada'ist phase for Lutens? I don't get it, and I give up. Hmmm. . . Serge and I live in different cultures. In mine, denizens of the night who wrap stuff in cellophane are usually drug dealers. Now if this were the ad for China White, it would make sense. Alas, I am not stirred by nighttime OR daytime cellophane. Serge and I have had our good times, but Louve, Rousse, and Sarrasins just haven't made me want to swoon. Or buy. I think I'll pass. lol! Also, the image of moths fluttering around a lamp doesn't paint a very romantic picture either. I too, shall pass on this. Serge, perhaps, has seen one too many Fellini films. Okay, I think I am getting a better image than some of you but it still doesn't make a lot of sense. Picture the lamps the moths are fluttering around as Chinese lanterns hung in a garden where crickets are chirping and their light is not too bright to obscure the stars. A young servant girl asks the master of the house if he wants her to wrap the gift he is holding in a cellophane bag, assuming it is for a paramour. He gives it to her, and says, no, it's for you. It is not a romantic name, is it? Hey, they might already have it! There are bottles for sale already. I do love osmanthus! Is it very fruity? HA — luckily (?) I do not know that song. Can't for this to be released here is Asia. I love ostmanthus. (pardon my spelling error!) i have always love Jean Claude Ellena's Hermes Yunnan Ostmanthus, so i am interested to get hold of Serge's interpretation. I think you have cracked the riddle. Or, it's really confusing poetry. The name just can't be the same as what I wrap leftovers. Please tell me it has a different name in French. Well, cellophane is much more stiff than plastic wrap you would use for food – it is what gift baskets and such are wrapped with, so it is more gift-ish. I couldn't give a monkey's about the name or ad copy since I love osmanthus! (And this is SL who is often er…. cryptic? )The other notes sound interesting in conjunction – maybe it will be quite aldehydic, in the way La Myrrhe is? I also read somewhere that this could be viewed as the lunar opposite to the solar El Attarine. Looking forward to trying it anyway. I think Nuit de Cellophane is a wonderfully poetic and evocative name (but then I am French, LOL!). Cellophane is what French florists have traditionallly wrapped bouquets of flowers (in a kind of 'berlingot' or pyramid shape; difficult to describe, sorry). Cellophane is light, thin, crisp, sparkling and, yes, as in the Chicago song, it conjures up something that's 'hardly there'. It's associated to the idea of giving (as previously mentioned) and elegance. I love it. Btw, I'm slightly puzzled by the blurb too. No, don't run away, Bella…I think your point is well-taken. I had just read your gloss on 'cellophane' and got a whole different take on that word which I didn't recall from my high-school French. Of course, for 'English speakers' we can probably substitute 'Americans' and hit a long-standing intercultural sore spot…. this should be an interesting string. I'm wondering if the perfume in question was Sublime Balkiss? There were a few others that raised a smile, so maybe not. 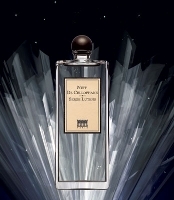 I'm thinking that the perfumeur has to steer a course between artistic freedom and commercial viability. Car manufacturers have learned that they simply don't sell cars in countries where the name means 'gigolo' or 'chubby bum'! They've had to learn to either use a different name in different countries, or do intensive research to find a name that's non-controversial everywhere. Women get embarrassed asking at sales counters for perfumes with gigglesome names, which is likely to reduce the sales performance of that juice. Don't forget that using the correct French pronunciation to most UK and US sales assistants gets you a blank look, so that you're forced to say 'linterditt' instead of 'lahnterdee' for something by Givenchy, which means that the anglicised name does matter. So I think it's in the perfume house's commercial interests to ask themselves a few questions about the name they're slapping on the juice if they actually want to sell it abroad. I love Osmanthe Yunnan too…it's one of my favorites! Hope this is as nice. I really liked El Attarine — that one has kept me interested in the new releases. LOL — true, I'm going to try it eventually no matter what he calls it or what the ad copy says. I also remember Serge Noire setting off quite a debate….. Laughing at a car called “chubby bum”! Thanks! And a good point anyway. although actually I'm also quite happy trying out my no doubt atrocious french accent when asking for a scent with a french name. It does sound more romantic. I agree that it may well come down to how commercial a perfume house wants to be. Serge Noire? Cellophane? The man is getting odder and odder. Let's see him have a crack at Triple-Walled Corrugated Board next time, or what I believe you guys know as Styrofoam. While most of us on here would state that perfume is a necessity, it is actually considered a luxury item. The world's top 3 countries for consumers of luxury goods are Japan, USA and China. China is expected to take over the number one spot by 2015. To say that someone should consider their market before they name a product is probably good advice generally speaking. However, look at your market more closely. I wonder what the Chinese name for “cellophane” is. Americans should realize they are not always catered to anymore. Also, Serge Lutens is considered a “niche” perfume by most Americans, therefore SL knows their share of the market will be smaller than say, Chanel for instance. So with that all said, I think it is very sophomoric for us Americans to expect SL to cater to us for any reason. You’re absolutely right! What the American consumer public seems to lack more and more is a sense of play, allusion, complexity. Everything is so literal and “department store” here. Bela, cellophane doesn't have such a romantic connotation to me at all — yes, it's the stuff florists use, but it's also the stuff wrapped around any commercial food product (in other words, it the wrapping on the box of oreos). Hmmm…don't know if it's up to the public to educate themselves. If the brand wants to create a certain image in the public's mind with the name, they ought to know what image the word evokes in the markets where they're going to sell. That said, the US is no longer the “target” market for most perfumes, so it stands to reason that some brands won't care what the name evokes here, and beyond that, SL probably doesn't care in any case! I got this today. It's like Chanel Beige with jasmine and a little orange. It's not overly fruity, though, but rather a bit soapy. It's nice and not much more. It certainly doesn't feel like a Serge Lutens! It's in the EXPORT group? Oh boy, I can hardly wait! Big fan of Osmanthus and jasmine that I am I can't imagine that I won't love it! FYI – long indepth review at the Scented Salamandar. Sounds interesting. That does not sound too enthralling — I liked Beige but didn't love it, and only rarely like soapy. Thanks for the info! I think there is a difference between the polythene used to wrap up food products and cellophane – at least in France. Cellophane has a 'sharp' feel to it: it's not stretchy. If you haven't seen a bunch of flowers done in the French way with cellophane, you probably can't visualize what I mean. That's it: Elixirs Charnels! God, the amount of copy that generated! LOL! As I've tried to convey in my comments: there is *nothing* odd in the names he gives his perfumes – at least as far as French speakers are concerned. The blurbs are another kettle of fish: they are incomprehensible at the best of times. I don't know what country the target market for perfumes is these days. Is it Japan? The Arab Emirates? I wonder if *they* too gripe about those 'odd' names or just accept them and try to learn what they actually mean. They do flowers that way here too, at least, in some florists. Tried on Skin today and really like it. It´s kind of J´adore extrait: jazmin and osmanthus but no fruit. Have to admit though it´s very femenine even for me, someone who uses Jasmin Noir and L´eau de Issey both in Eau de Parfum. But maybe for special night I would wear it. I wouldn´t regret a sample for that reason. It’s really pretty. I never did fall in love with it though…I could settle for a sample too.